Never heard it called that. “Ball up” perhaps. Oh. My. Good. God ! FYI — you don’t have to have a (permanent) disability to use a wheelchair. I do agree that in general terms the umpire is known to ball up at the beginning of the game, but he actually bounces the ball down (at present at least), and I was making a meaningless response to “kick off”. The joke had nothing to do with anybody with a disability. It was about Joes groin being ■■■■■■. You’re the one making the wheelchair/disability link. You realise wheelchairs aren’t just for people with disability’s right? I’m always very sensitive to how these things might be interpreted but you’re just being an idiot. When you get a calf tear, it actually feels like someone kicked you in the back of the leg ( at the moment the injury occurs). Immediately after that, you virtually cannot walk. Like you are anchored to the spot. It is extremely painful. I experienced that in the first 5 minutes of a grand final due to lack of a proper warm up. I was ■■■■■■ with that as I sat on the sidelines. I tore a calf a few years back and it also felt like a kick to the back of the leg. I didn’t get a kick to the back of the leg, it just felt like it. I was mid 30s and fat. You can’t tear someone’s calf by kicking them in the back of the leg. You can give them a contusion but it is highly unlikely that the muscle will suffer structural damage as a result of a blunt trauma. It is even more unlikely that you’d get a 4-6 week tear. Muscles don’t work like that. Essentially, Joey thought he had been kicked in the calf. Reported it as such, but it was actually a tear, which feels like a kick to the calf when it happens. I still find it odd that a kid in his mid 20s, well hydrated and eating well, coming off a slow build up in a managed recovery program run by experts, would pop a calf. I popped a calf when I ran 5km and then tried to play a basketball game when I was out of shape, 35, 95kgs, and full of greasy ■■■■ because I was hungover. I find it odd that a calf was all you popped. Mildly surprised you’re still around to post. To put it another way, a young professional athlete risks a minor muscle injury. From your self assessment you were risking resuscitation. I owe an apology here. I’ve been a big fan of Joey but I did think he was the source of confusion/congestion in our forward structure. Think I debated it with a few posters as well. Clearly I was wrong, as we were equally (if not more) woeful than we were at the start of last year. i was in a wheelchair for half of 2014, i attended a game at the g. jobe was sent off with the blood rule, some opposition pelican yells out “do you want a wheelchair watson, ya sook?” i replied with a “it’s ok, he can borrow mine”. got a good laugh form those surrounding and the oppo supporter felt like a bit of a clown. How many week joe daniher return? No he hasn’t. You’re reading an injury report compiled by a bloke who hasn’t even so much as spoken to the injured player, let alone actually assessed him. It’s ■■■■■■■ garbage. Crow said available in 2 weeks. No it’s worse. 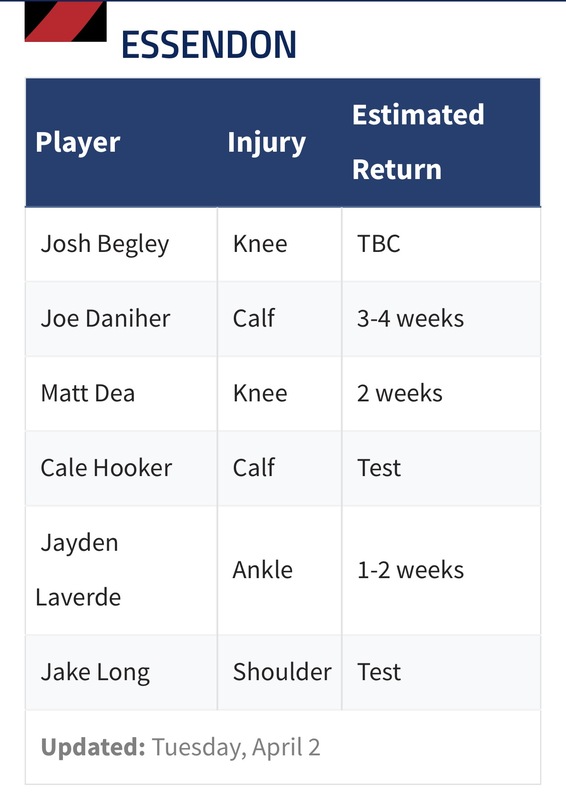 It’s the self appointed AFL injury expert Doc Larkins making assessments on injured players with literally no idea of the actual severity of the injuries or progression of rehab. They are terrible. Maybe between us we can resolve this. It’s the work experience kid shadowing Larkins who writes the copy.